In ancient times, people referred to the feast of the Assumption of Our Lady as the feast of Our Lady of Glory. They understood that the Assumption of Our Lady was not merely the physical event of her leaving this earth after resurrecting by virtue of her Divine Son and being taken to Heaven: it was also her glorification. After her humble and unknown life on this earth, Our Lady had a greater role after the death of Our Lord as Queen and Mother of the Catholic Church. Our Lady went through all kinds of suffering, anguish and humiliations on earth. It is fitting that Our Lord glorified her in the eyes of men through her assumption. 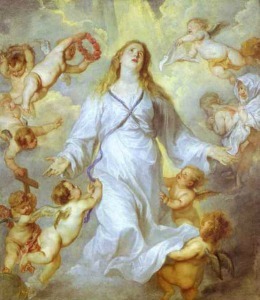 She was glorified with this unique privilege whereby a merely human creature is taken to material heaven by the angels. From there, she certainly was taken in a mysterious way to the physical and immaterial heights of the heavenly Paradise, where she finds herself at this moment enjoying the beatific vision of God, Our Lord in an ineffable way. Many traditions and revelations about the assumption naturally affirm that this glorification by the angels was accompanied by indescribable manifestations of glory. Our Lady was a mere human creature with a nature far inferior to that of the angels. To show the great difference between natures, we need only recall how one saint saw her own guardian angel and was so dazzled by what she saw that she thought that she was seeing God. And yet guardian angels are among the lowest ranks of angels in heaven. We can only imagine the glory of Our Lady who was taken to heaven by the highest Cherubim and Seraphim. She was served by God’s highest creatures with such a high respect and veneration that it was as if they considered themselves unworthy of presenting to her their prayers and veneration. Thus, after bidding farewell to those on earth, Our Lady started rising off the ground in a most hallowed ecstasy; and at a certain point the manifestations of the angels began. If it is true that on Easter day all nature rejoiced, and that on Ascension day all nature was jubilant, then, of course, we can imagine the great and splendid joy of all nature on the Assumption of Our Lady. We can imagine the splendid colours of the sky. How the stars of that night must have shone! If the sun danced and changed colours at Fatima, we can imagine the wonderful way it must have appeared on that day! The angels must have sung in magnificent harmony and all must have felt great and ineffable interior consolations! 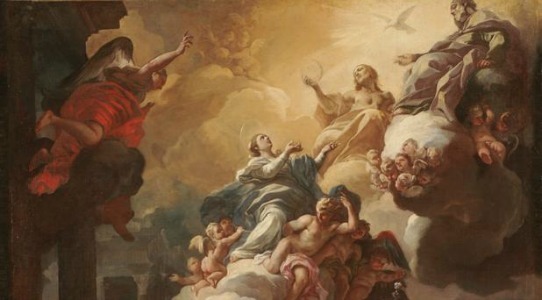 The concrete and positive fact is that Our Lady allowed her inner glory to be manifested to all during the Assumption. We can imagine how she, who possessed a most holy soul and an inexpressible dignity and majesty, at that moment allowed her grandeur to be manifested in an extraordinary way. As Our Lord’s grandeur shone in His glorified body on Mount Tabor, so also her sanctity naturally and entirely shined forth in her eyes, countenance and body. We can imagine this manifestation like a great flash of light that completely blotted out the sky. At that moment of this grandeur, she probably manifested a great maternal tenderness since she was a mother bidding farewell to her children. She also must have shown a great outpouring of mercy and supreme goodness as she made it clear to everyone that she would no longer be present on earth and that, at the moment she was leaving mankind, her great mission in the pinnacle of heaven was beginning. Saint Therese of the Child Jesus said she wanted to spend her heaven doing good on earth. If this is true of the Little Flower, how much more we can say this of the glory of Our Lady! From the time of the Assumption onward, Our Lady’s glory has been increasingly manifested. We see this in the construction of a huge number of churches dedicated to her. As Saint Louis Grignion de Montfort aptly observes, no church on earth – except perhaps churches that are almost no longer churches – does not have at least one altar dedicated to Our Lady. Not one soul has been saved without having been one of her devotees. Men have received no grace except through the intercession of Our Lady. In other words, her glory will increasingly grow until the end of the ages when the moment of the Last Judgment comes. On that day, everyone, including her, will be judged. However, since she is faultless and without guilt, Judgment Day will be the day of her supreme glorification. If all virtues and defects of all creatures will become known at the Judgment, what canticles of praise will Our Lord Jesus Christ, the Holy Ghost and the Eternal Father sing of her on that day? It is beyond words. The joy of the Last Judgment will be this glorification of Our Lady at the end of history. When history is no more; when the life of humanity has come to an end and the final historic event is over, then she will receive a truly unfathomable glorification. The preceding article is taken from an informal lecture Professor Plinio Corrêa de Oliveira gave on August 13, 1965. It has been translated and adapted for publication without his revision. –Ed.